Taisho Bistro is an Izakaya, an informal Japanese drinking establishment that serves food and caters to the after-work crowd on Sheridan Drive close to the University at Buffalo North Campus. The decor and atmosphere are unexpected and intriguing, almost reminding me of a snazzy bar downtown with chic hanging fixtures and fuchsia and blue lights to brighten up the bar and dining area. They serve everything from sushi and hibachi to noodles and barbecue Yakitori‏ (skewered meats). If you’re a sushi lover, this is the place to be for affordable lunch specials. But even if raw fish isn’t your cup of tea, don’t sweat it. There are plenty of options that are vegetarian or fully cooked. 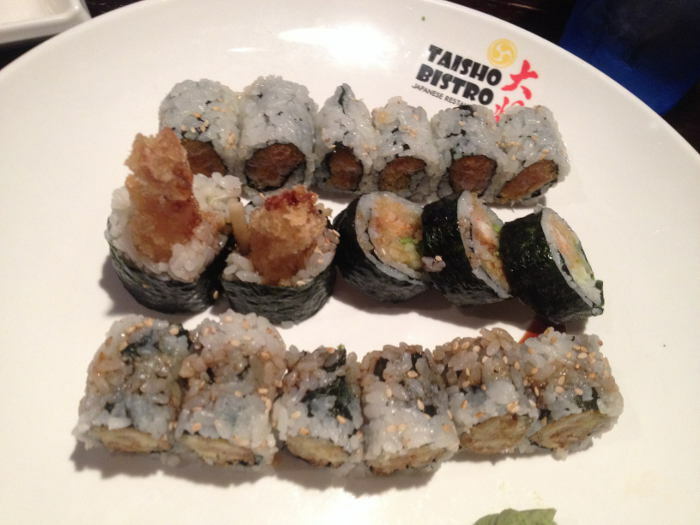 Check out Taisho Bistro for after work drinks and apps or an inexpensive, satisfying lunch. Whenever I’m at Taisho for lunch, I feel compelled to take advantage of their affordable lunch specials. Depending on how hungry you are, there are a few sushi specials to choose from. Order 2 rolls for just $7 or 3 rolls for $10. With everything from the vegetable roll and sweet potato roll to their shrimp tempura roll and raw salmon roll, there are choices available for many different tastes. In addition to the sushi roll lunch specials, Taisho Bistro offers the sushi & sashimi (5pcs sashimi,‏ 3pcs sushi & California roll) for $11, sushi special (5pcs sushi & salmon roll) for $10, and the sashimi special (9pcs sashimi & bowl of rice) for $10. The sushi lunch specials come with your choice of soup or a salad included in the price. 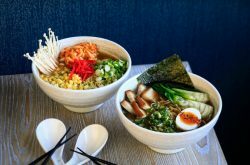 Taisho Bistro offers plenty of lunch combination plates ranging from $8.50–$9.50 served w/ soup, salad, white rice and pickled vegetable and hibachi lunch specials ranging from $8-$14 served with your choice of soup or a salad. Although you may find it hard to resist their inexpensive, quality lunch deals, we should mention Taisho Bistro offers dinner entrees and specialty sushi rolls, as well. I’m a big sushi lover myself, so when friends asked me to meet them for lunch at Taisho Bistro for their sushi specials (Monday to Saturday from 11am to 3pm), it was a no brainer. Located in a plaza off of Sheridan Drive is a vibrant sushi spot with plenty of tasty Japanese options. My friends and I sat down to enjoy the 3 rolls lunch special. I enjoy all seafood, but generally I like to choose from the sweet potato roll, spicy tuna, spicy salmon, shrimp tempura and spicy yellowtail. I placed my order for 3 sushi rolls and a hot cup of miso soup. The soup is a nice, light option to take the edge off of those hunger pains while you wait for the main dish. Just after finishing my soup, the waitress promptly delivered a plate of 3 sushi rolls; sweet potato, tempura shrimp, and spicy tuna this time (usually about 5-6 pieces per roll). When I taste a mouthful of my shrimp or sweet potato, the rice still warm from the hot center or the cool, fiery flavors of the raw spicy tuna roll combined with the texture of the seaweed is beyond satisfying. I enjoyed my first meal so much, that I’ve stopped back since then and plan on visiting often in the future after noticing all the unique items I have yet to try. When I stopped by for the second time, my appetite and I were ready to try something special. The photos guiding me throughout the menu sparked excitement to indulge in something new to me. I decided to order the Takoyaki which was unlike anything I’ve ever tasted. 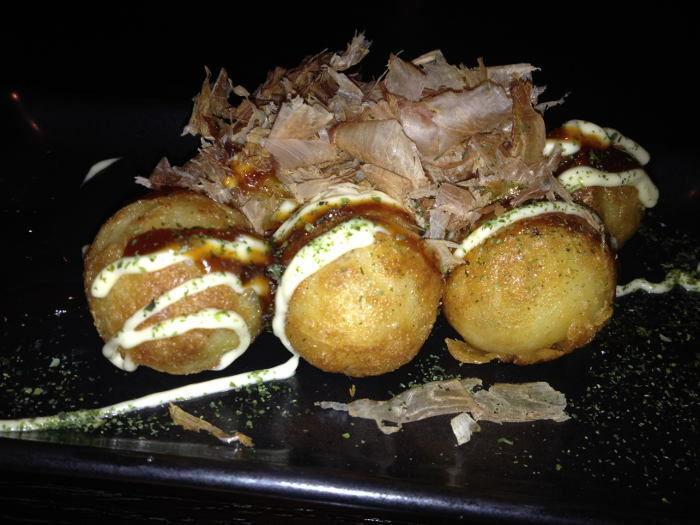 Takoyaki ($5) are crispy, golf ball sized treats containing juicy tidbits of octopus. They were placed in front of me, trickled with mayo and sweet BBQ sauce, topped with thin flaky pieces of dried, smoked bonito (a type of fish). I stuck my fork into the center of the Takoyaki to cut a hearty bite off. As steam escaped, I cooled off my bite before savoring the combination of flavors in the dish. I tasted smoky, sweet, creamy and salty components. This appetizer was truly an eye opener. 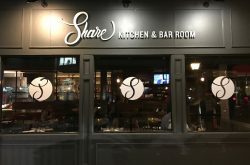 The staff is always friendly and polite. 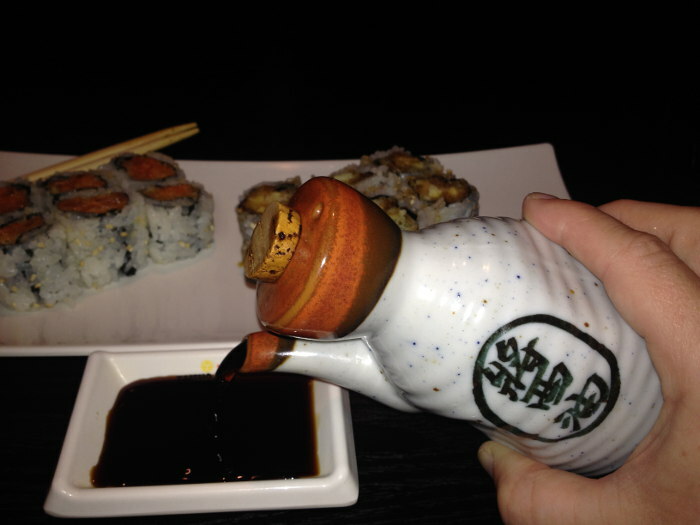 All in all, Taisho Bistro provides a very pleasurable dining experience that won’t break the bank. Okonomiyaki $7.50 – Osaka style pancake with shrimp, bacon, of vegetables served w/ okonomiyaki & mayo sauce. Oden Japanese Hot Pot $6.50 – Pork bone soup w/ assorted fried fish balls. 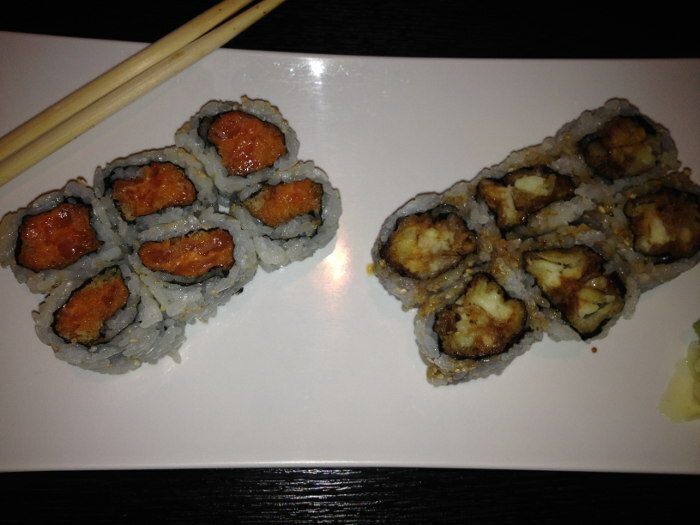 Legend Roll $16 – Lobster tempura,‏ avocado, topped w/ seared scallops, jalapeno served w/ spicy sauce and eel sauce. 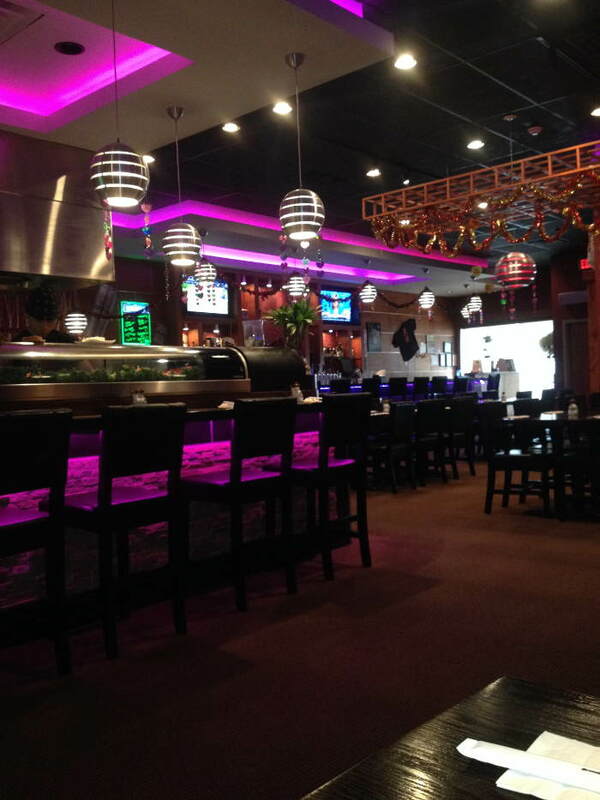 For more information on Taisho Bistro, visit their website or follow them on Facebook.